A black and white negative of a portrait of John Lawrence Smith. Brian Winter took a photograph of the original portrait that is held in a private collection. John Lawrence Smith was born on Lot 21, Broken Front Concession, Whitby Township, on 11 October 1838, and was a farmer all his life. He was one of the founders and first trustees of the Whitby Methodist Tabernacle, and a founder and member of the Board of Directors of the Ontario Ladies' College in 1874. He was a member of the Whitby Township Council in 1875-77 and 1890-92; Deputy Reeve in 1893-97 and Reeve in 1883-4, and in 1898. He was Warden of Ontario County in 1884. He died at his farm at Corbett's Point, Lot 21, Broken Front Concession, Whitby Township on May 24, 1928 and is buried in Union Cemetery, Oshawa. 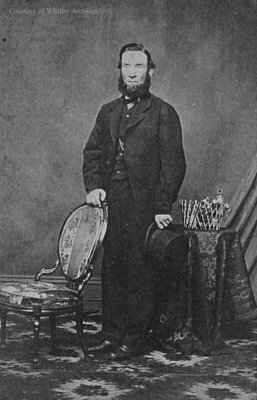 John Lawrence Smith, c.1870, Photographer Unknown. Whitby Archives A2014_005_011A.